I cannot manage to find the button I need to sew onto my real-world everyday winter coat, but I’m pondering and plotting how much broadcloth a Redingote (Redingcoat or Redingcote) would require, and internally debating the merits of red versus green. Greatcoats have their attractions, and while Mr S would undoubtedly enjoy the warmth of a greatcoat, with a February 14 program in the offing, I am pondering a greatcoat of my own. I can rationalize [almost] anything, but a Redingcote is a stretch even for me, despite that February program (indoors). I suppose the real appeal of one of these coats, aside from the pleasure of handling delicious green or red wool, is the challenge of making one. I have even found a front view to aid in the patterning. What stops me? Some unfinished projects, and a certain feeling of unease about buying quantities of expensive wool. I have two yards of dark green broadcloth, but I’m pretty certain that I will need three to make even the shorter red coat. Without making a firm resolution, I had determined that I wanted to sew down my stash–and I suppose the answer is to sew it down, or put it on Etsy. Or to buy the wool, make the coat, and wear it in the winter. It would be a spur to winter program ideas, after all. Red coats are so cheery! 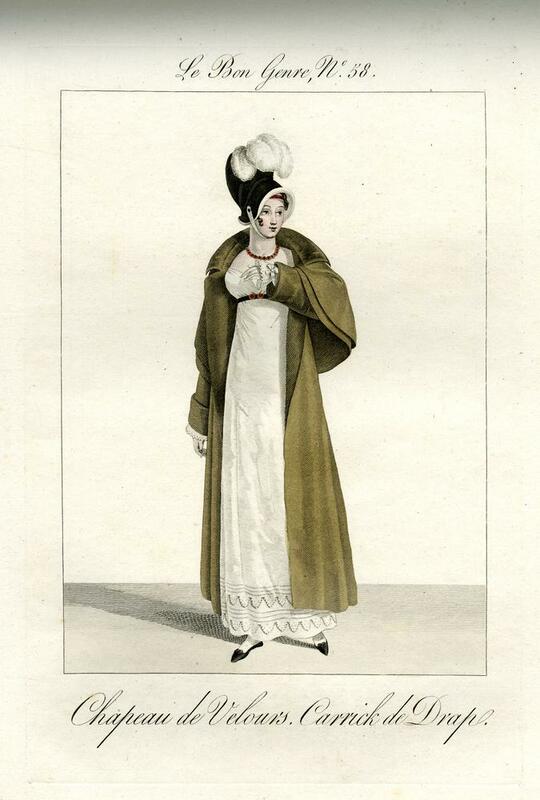 But my favorite redingote of all I ever got to wear was one made for me in an 1810 production. 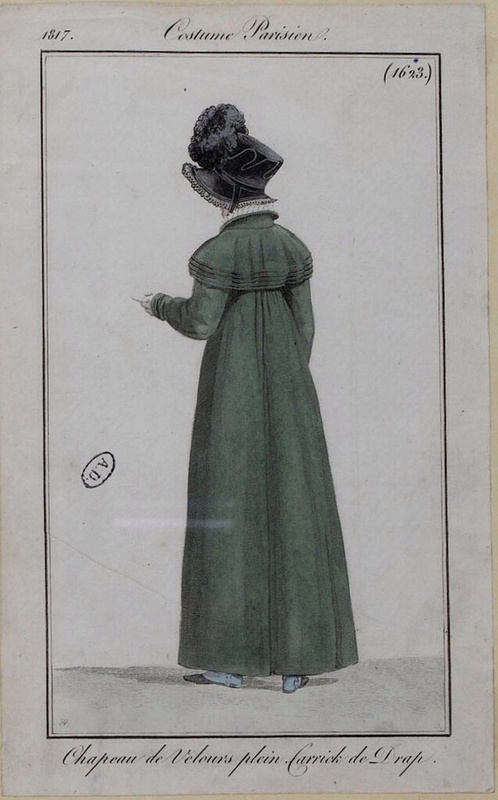 It was dark bottle green, with a velvet standup collar and cuffs with covered buttons in velvet to match. I wish I’d gotten a pic of it! It didn’t have the capes, probably to save fabric costs. The bodice was double breasted and snug and it went over everything. Keep me posted, especially about construction details! I thought about buying an additional yard of the bottle green wool I already have, but it won’t be available till next April! Still on the fence, but wouldn’t red be cheerful? Oh, decisions! 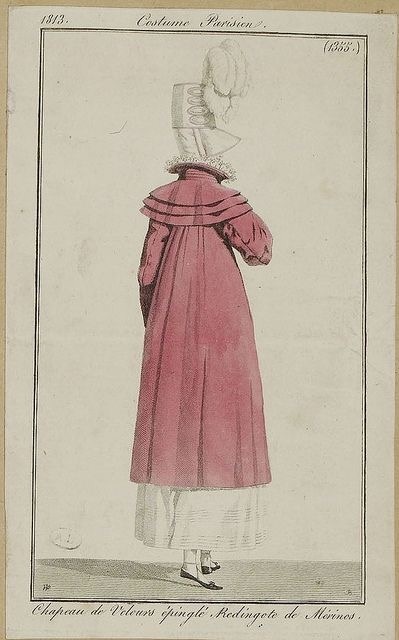 If you make a shorter-length redingote like the red one, you could wear it for 21c use as an elegant and unusual winter dress coat. Would that help you to rationalize the expense? I did consider whether or not I would or could wear it as my winter coat. I haven’t decided– but that would help me rationalize the expense. I know someone who wers his Civil War greatcoat for similar reasons…. At a time when I needed a curved coat sleeve to accommodate nerve damage to an elbow, I made myself a rocquelaire, a mid 18c man’s greatcoat, as a winter dress coat. It was a far less elegant garment than the one you’re contemplating. Nevertheless, it served me for the few years I needed it, until the nerve damage had healed sufficiently, and then I sold it to a young reenactor who was thrilled to have it. So, yeah, it’s been done, you wouldn’t be the only one.